Retired Sergeant Major Bradley E. Trudell is a 28 year Marine veteran. He and his wife, Allison Kanaley Trudell, now live in Mexico, N.Y., and raise Scottish Highland Cattle. Audio by WRVO staff, video by Bruce Strong for the Veterans Listening Project. E-4 Tina Ruth and husband E-5 Dan Ruth, both retired, served in the U.S. Navy. They are both seen here with their daughter, Mesa, 3, as they listen to their interview the day it was first aired on the radio. While expecting their first child, Rachel and Rich Dorling both received orders to deploy to Iraq. The couple listen to a conversation they had while reflecting on their circumstances at the time, being separated and the overwhelming welcome home. Audio by WRVO staff, video by Andrew Burton for the Veterans Listening Project. Retired Navy Master At Arms 1st Class, Mike Prime, 61, and his son, Mikey Prime, 19, are both seen here listening to their interview. Mike Prime served with the Navy for 3 1/2 years active and another 30 years in the reserves. During that time, he served on the USS New Jersey and the USS Bradley. Bob Fatiga, right, 44, was in the Navy for over four years during the first Gulf War. He served on the aircraft carrier U.S.S. John F. Kennedy during that time. Here he is seen with his father, Jack Fatiga, 67 listening to their interview for the Veterans Listening Project. Audio by WRVO staff, video by Andrew Maclean for the Veterans Listening Project. John Allis is a Vietnam vet living in Syracuse, New York. He talked with Andrew Young who has served multiple tours in Iraq as a photographer for the U.S. military. Here, they are filmed listening to their conversation about the lingering mental affects of war. Mostly, John just listened as Andrew shared intense stories of combat. But what really concerned John was what Andrew plans to do next. 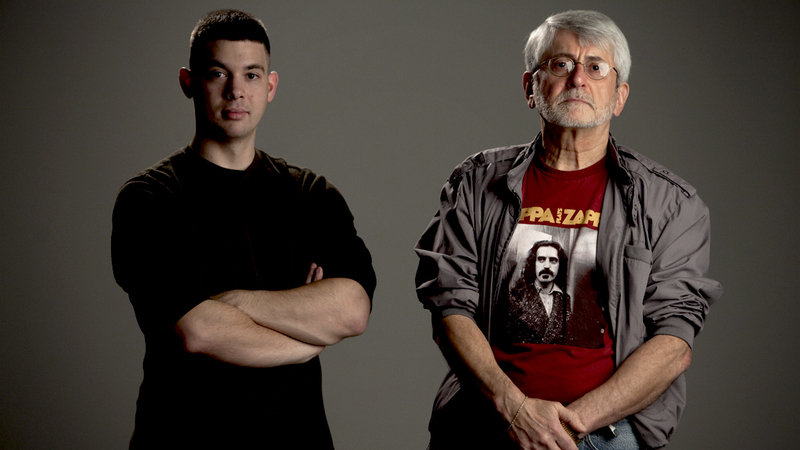 Audio by Ryan Delaney, video by Brad Horn for the Veterans Listening Project. Retired Army PFC Carl Revette, 83, and his wife, Esther, 81, listen to their Veterans Listening Project interview. Audio by Chris Bolt, video by Bruce Strong for the Veterans Listening Project. Retired 2nd Lieutenant Don Waful, 93, and Casey Ryan, 28, are seen here as they listen to their Veterans Listening Project interview. Waful was in the Army during WWII, serving as part of the north African invasion force. He was later captured and held as a POW in the German prision camp, OFLAG 64 in Schubin, Poland. Not many people have had a musical written about their life, but Don Waful has. Don met his would-be wife, Cassie, in 1942, in Belfast, Ireland while serving in the army. Their incredible true story was made into a musical called, â€œIâ€™ll Be Seeing You.â€� Casey Ryan portrayed a younger Don in the Syracuse production of the play, and spoke with Don in our studio. Jason Atwaters is 10 years old. His dad, 2LT Derek Atwaters has been active in the Army as a mechanic for 18 years. Jasonâ€™s mom is a chemical officer, active for 14 years. She is currently in school in Missouri for chemical training; Jason and Derek live in Oswego. Jason asks his dad if his view of the service changed after he was born. Audio by WRVO staff, video by Kate Szrom for the Veterans Listening Project. In her senior year of college, 22-year-old Vicki Smallidge, in red on right, enlisted in the Army as a 91W Healthcare Specialist, trained in trauma medicine. After serving for four years, with discharge papers in hand, and ready to return home to Oswego, NY, Smallidge received orders to deploy to Iraq. Ten years later, Smallidge and her friend, Jessica Czajkowski, reflect on her experience. Here she listens to her own Veterans Listening Project interview. Audio by WRVO staff, video by Juliette Lynch for the Veterans Listening Project. Christopher Sweeney sits down with his wife, Sarah Sorrell. They talk about Chris' time as a Marine in the Gulf War, his discomfort with receiving the Silver Star, and the healing value of the arts. Danny Hernandez, 65, from East Los Angeles shares memories of serving as a Marine in Vietnam with his daughter Priscilla, 31. Hernandez recounts Operation Utah, the Walk-Outs of East Los Angeles, and the experience of receiving the Silver Star for Gallantry in Action 43 years after his service. USC Annenberg journalism professor Bryce Nelson talks with professor Ed Cray about Cray's experiences in the Korean War learning to lead others, serving and living with black men, and the smell of kimchi he'll never forget. Michael Herrera talks with his granddaughter and Annenberg Radio producer Jessica Flores about his service in the Philippines and Japan during WWII. Herrera remembers almost getting shot while stocking up on water and how he learned a Japanese lullaby while teaching accounting in Japan. U.S. Army Sergeant and war veteran Maria Uribe talks with her sons David, 8, and Isaac, 6, about what it is like to overcome the many obstacles of starting a family while serving in the armed forces. She told her sons how proud she is of them and explained the honor she feels for serving her country. Jumping ship, floating in the oily water and being told not to get anything dirty in the midst of bloody battle highlights Garth Brownâ€™s retelling of his experience on that fateful December day in 1941 at Pearl Harbor. Cooper Brannan is an Operation Iraqi Freedom veteran. He joined the U.S. Marine Corps out of high school and served four years. During that time, he deployed twice: to Hitt in 2004 and Fallujah in 2005. During his second tour, a flash bang grenade malfunctioned and he lost the medial part of his left hand and his little finger. After recovering, Brannan joined the all-Marines baseball team. A chance encounter with San Diego Padres CEO Sandy Alderson, a former Marine who served in Vietnam, led to him being signed by the Padres' minor league team in 2007 as a pitcher. He was released this year. The 24-year-old has a wife and two children and now lives in Phoenix, AZ. Lee Councilor grew up in the desert, but discovered he loved the sea as he served on four different Navy submarines from 1977 to 1995. He recalls life underwater with â€œ165 guys in a sewer pipe for 90 days at a timeâ€� with limited news from home. He is now the facilities operations manager for Queen Creek, Arizona. George Ertel, a native of Ohio, served in the Vietnam War as a food supplier. After the war, he earned a masterâ€™s degree in finance from Northwestern University. He has been living in Phoenix. Arizona, since 1987. Dennis Fitz-Patrick served in the U.S. Army from November 1968 to September 1970. He deployed to the central highlands of Vietnam for an 11-month combat tour, during which he rose to the rank of sergeant. After returning to the states, he worked as a CPA before spending 26 years as a special agent of the FBI. He retired in 2001. He lives with his wife in Phoenix, Arizona. Sgt. Michael C. Laird, 30, served as a sniper team leader for the 101st Airborne of the U.S. Army. Laird was deployed to Iraq from February 2003 to February 2004 and September 2005 to September 2006. He and his wife, Lisa, now live in Phoenix, Arizona, where he was born and raised. Hugh Phillips, born in 1922 in Salt Lake City, Utah, served from 1942-1945 in the Army Air Force. He was a gunner on a B-29 bomber in the 73rd Bomb Wing in the Pacific Theater of the war from summer 1944 to summer 1945. He moved to Tempe, Arizona, where he still resides, in 1965 with his family. Walter Switzer was in the ROTC program at UCLA when the Japanese attacked Pearl Harbor. Shortly after, he received his diploma and was ordered to active duty on the USS Farragut in the Pacific Theater. At 89, he looks back on his experience in the Navy not as a time of fear but one of triumph.